In high school, Maki Eiji was a delinquent, often skipping class and getting into fights. One girl, Chino Kotoha, was kind to him, until she was targeted by delinquents due to their apparent relationship. Suffering their attack seemed to have permanently changed her for the worse. Years later, when Eiji sees her again, he is overcome with guilt and regret. To his surprise, a mysterious scantily-clad woman suddenly appears, claiming she can send him back in time to make everything right! He takes her up on the offer, but things are not as simple as they may have seemed back then. It turns out that Kotoha had her own painful secrets in those days, and Eiji may not be the only one traveling in time to change the past! This is a manga based on the horror-style exploration/ero-game of the same name. Reiichi heads off for a part-time job interview, hoping to get money for a new bike, and his self-styled servant Kuro-senpai tags along. The "interview" is in a western-style mansion, but no one seems to be around. The two of them end up locked in the mansion and must find their way out! Hensokukei Quadrangle seems like it will shape up to be a pretty complicated story, since changing the past is never as easy as it might seem. Happy Sugar Life was far more interesting and disturbing than I would have guessed from the art and the title. 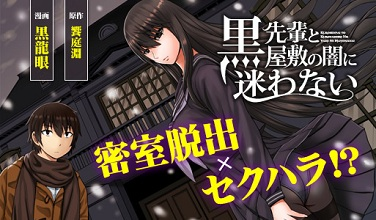 I'm not sure I'm convinced the mix between horror-exploration and ero-game works for Kuro-senpai to Kuroyashiki no Yami ni Mayowanai, it seemed kind of awkwardly combined to me. 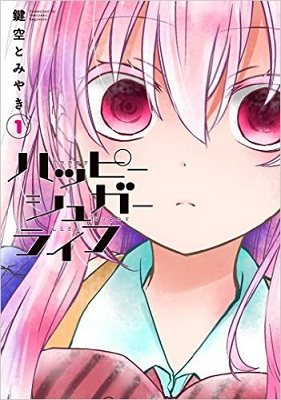 Happy Sugar Life - If you would like to read a manga about a girl who's a bit obsessed with a boy and the love she has for him, then you may want to take a look at this manga. 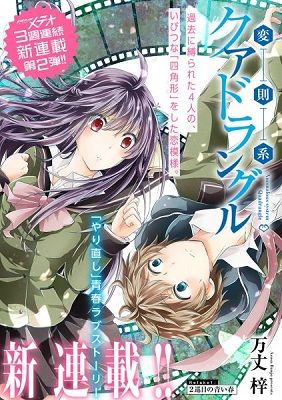 Hensokukei Quadrangle - If you're in the mood for second chances and want to see how a boy tries to fix his past mistakes in order to protect a girl, then check out this manga instead. Kuro-senpai to Kuroyashiki no Yami ni Mayowanai - If you like manga based on games, more specifically ero-games that have elements of horror, then you may like this manga. If you haven't done so already, check out the scanlations of the manga from previous shout outs which have been recently scanlated: supernatural drama Zerozaki Soushiki no Ningen Shiken (MH link).